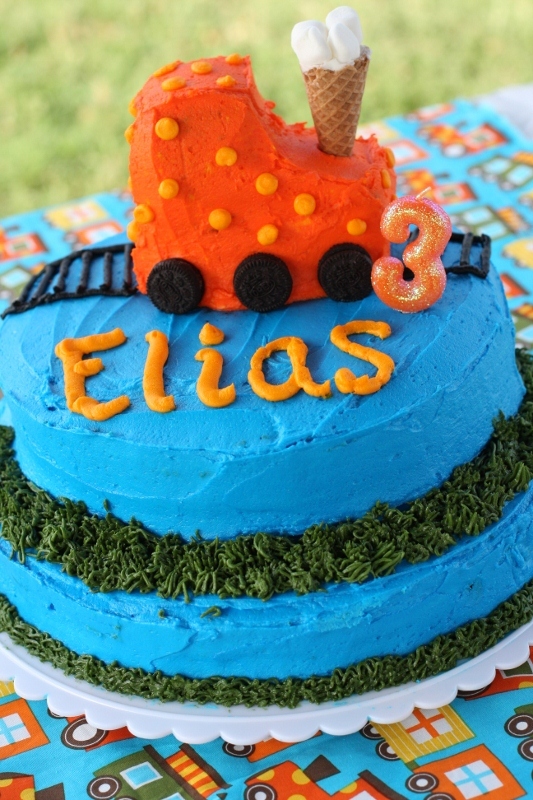 Things have been a whirlwind since Elias’s train birthday party, but I am excited to finally share all the details with you! This might get a little long, but several of you have asked for the nitty gritty, so here it is. I was really pleased with how everything came together. 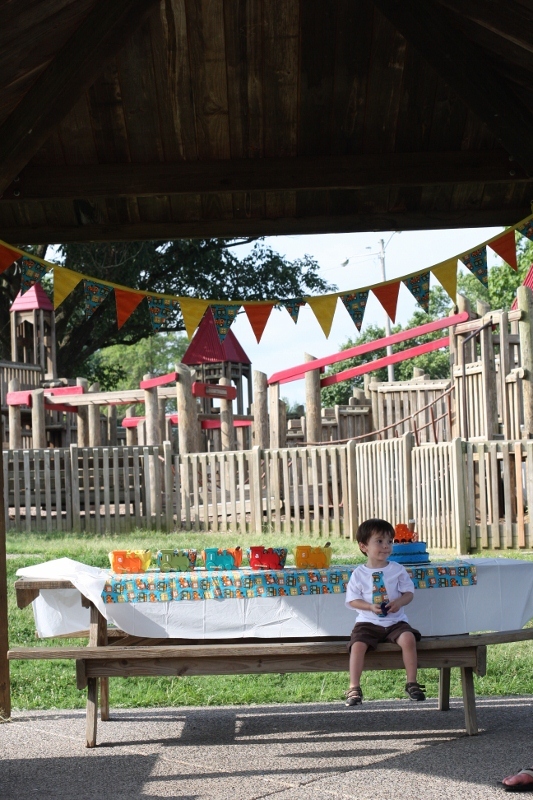 We had the train birthday party at a local park and kept things relatively simple. Elias wanted a train party for his third birthday. He didn’t specify a particular kind of train party, so I wanted to go with a generic train-themed party. I decided to use my Nashville-based designer Kelle Boyd’s Ann Kelle Ready Set Go train fabric as the base for all the decorations. Kelle sent me a few yards of the fabric (I am obsessed with her fabrics!) and I went to work. I ordered these invitations from Zazzle. They came quickly and were so cute. 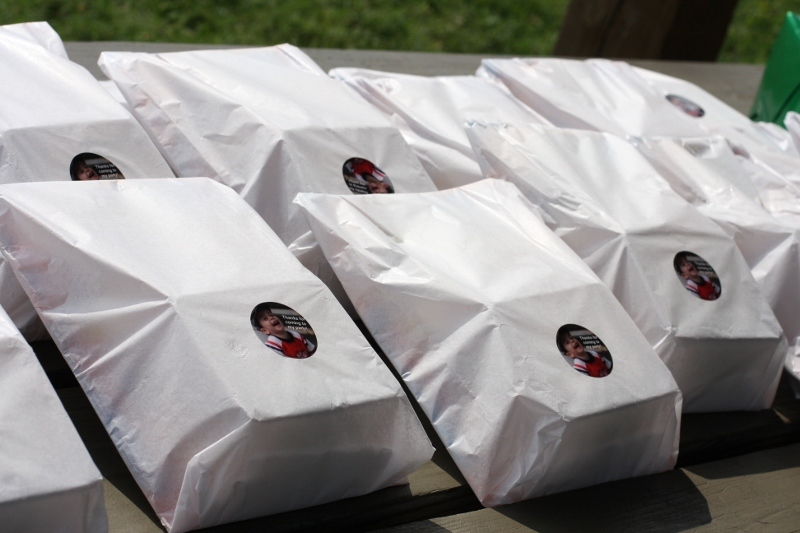 I loved having Elias’s picture on them. 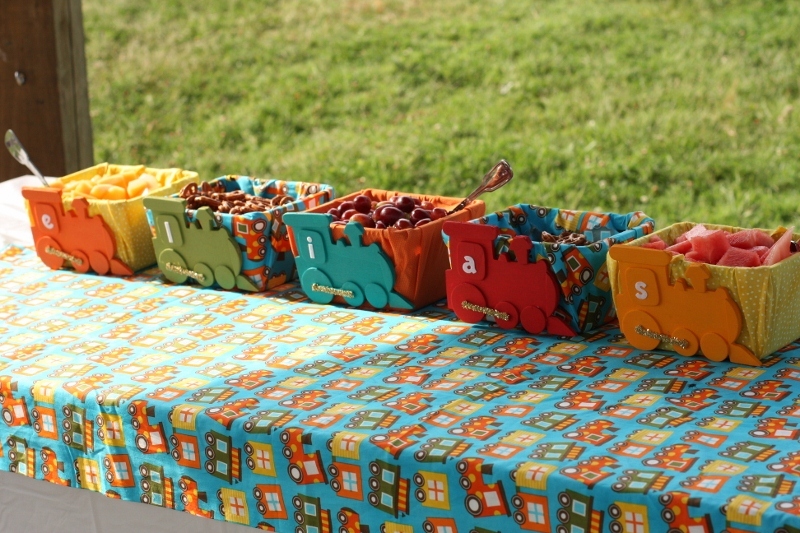 Thanks to Pinterest, I found an easy tutorial to make a bunting, which hung over the food table. I used orange and yellow accent fabrics, which I purchased at JoAnn’s. It only took me a few hours to make. I cut the triangles one night after the kids were in bed, and then sewed everything together during a couple nap times. SO easy. I will definitely be making more of these. I loved, loved, loved how it turned out. 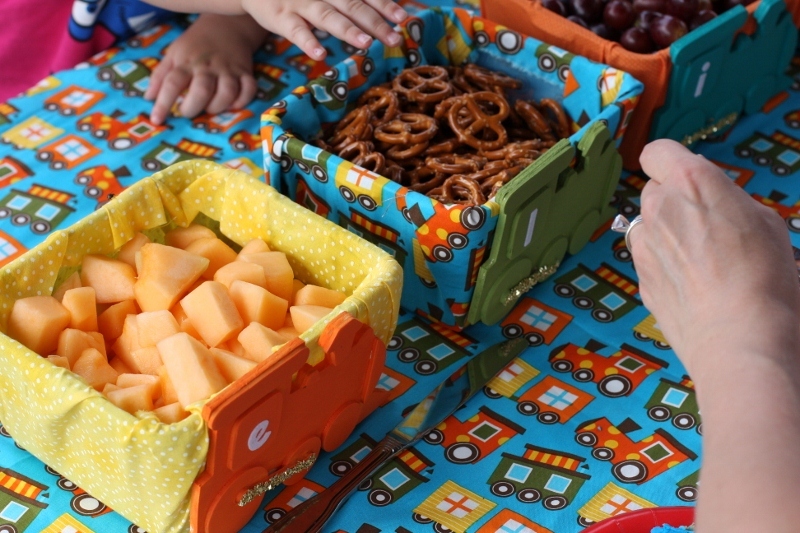 I used a chunk of the train fabric as an accent on the food table and used fabric scraps in a basket for the plates and utensils. The food containers were one of my favorite pieces. I bought wood trains at JoAnn’s and painted them colors that coordinated with the fabric. I then added a letter to each piece to spell ELIAS, as well as gold glass glitter. I bought cheap rubbermaids at the Dollar Store and hot glued fabric to each (the same fabric as the bunting). I then hot glued the trains to the covered rubbermaids. They were so cute on the table. We also used a Balloon Time helium tank to fill balloons and tied them around the pavilion. Many of the kids also wanted their own balloons and we had fun filling them up! I love these tanks. They make small ones that you can get at Target for only $20. Well worth the fun! I know that there will not be many years that I can coordinate Elias and Adeline’s attire, so I took advantage of things this year and made coordinating train outfits for them for the train party. For Elias, I cut a tie out of the train fabric and used iron-on adhesive to adhere it to a plain shirt. I think stitched around the tie to make it sturdier. It was so fun and easy – I would love to do this again. For Adeline, I found this easy tutorial to add a skirt to a onesie on Prudent Baby. (If you have never been to this site, be prepared to spend a chunk of time getting sucked in. It is amazing). I will say it did NOT take me 10 minutes, but I am not a very skilled seamstress. It would have taken me about 45 minutes, except I sewed the skirt on upside-down and had to detach it from the onesie and sew it on a new one). I also added buttons around the neckline which I thought made it a lot cuter. I hemmed and hawed about the train birthday cake. Originally I was going to make a series of small cakes to form a cake, but that overwhelmed me a bit and I was worried it wouldn’t feed everyone at the party. The colors coordinated with the fabric. Elias LOVED it and that was all that mattered! We also had train hats for the kids, which were especially cute in pictures. I ordered them from Oriental Trading. 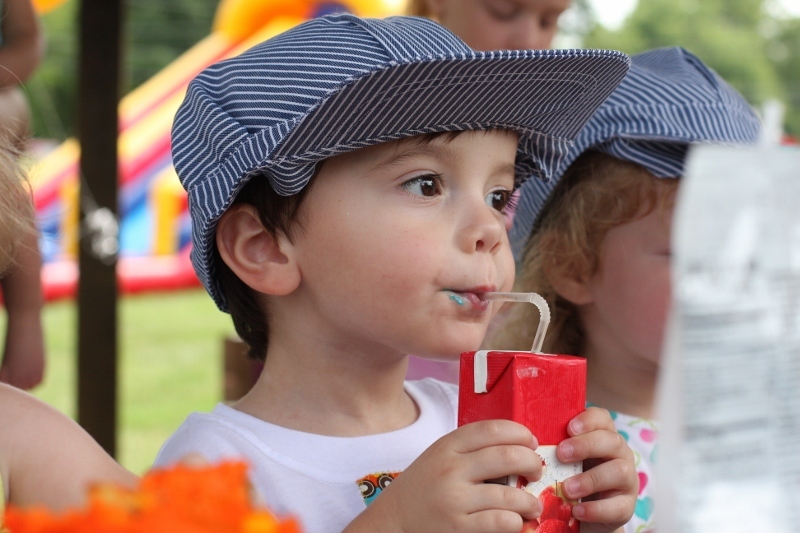 All in all, the train birthday party came together beautifully and the kids had a great time! I love his little t-shirt!! And the food baskets are great. What a fun party!!! I am so impressed. I’m doing a fire truck birthday for my son next week and am going to go get the helium tank. Thank you fir the idea. Thanks for sharing. Love the train baskets and the conductor hats. I am new to your blog and haven’t commented before, butwanted to stop by and finally say hey. First off you did an AMAZING job with Elias’ train party! 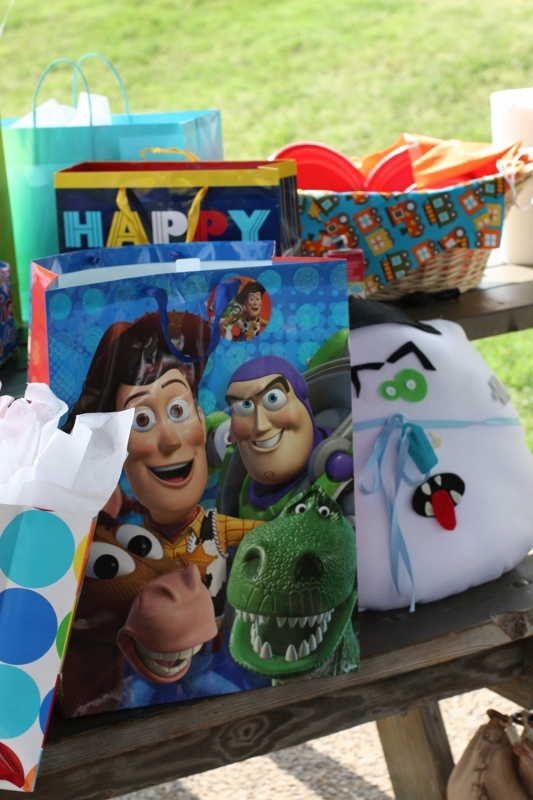 I did a generic train party for my son’s 2nd birthday party last year and it was so fun. I only wish I knew about Pinterest last year to help when I was trying to come up with a NON Thomas or Little Engine themed choo choo party, and finally found most of what I needed with my tried and true etsy website. I love the shirt and dress you made the kids, so cute! I’m still impressed you did all of the decorations and cake and outfits, all with a newborn! You’re awesome 🙂 I am only hoping to have that much energy for my son’s birthday this November, as I too will have a newborn by then with my daughter, due next month. You did an excellent job coordinating the party theme! I have an “interest” in pintrest and it appears you need an invite to participate. How do I get invited? My email is [email protected]. I love all the ideas you got from it! Thanks so much for all your inspiration & cost saving tips! 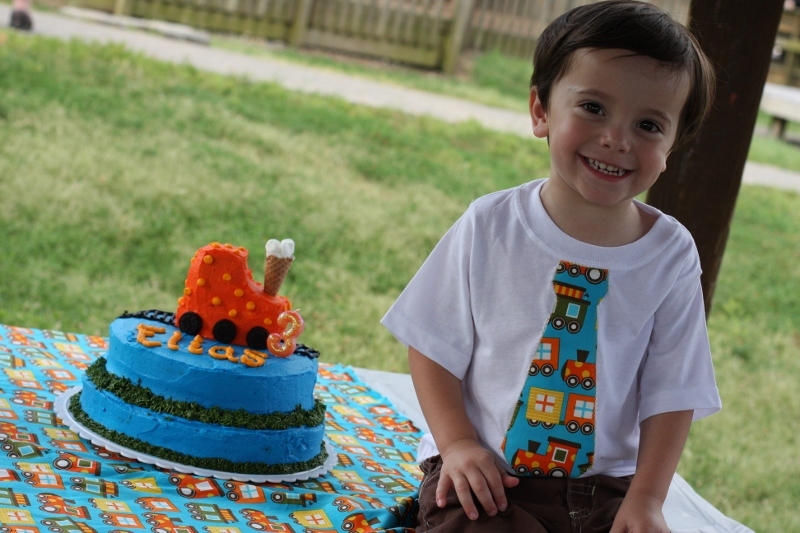 Elias’s train party is absolutely adorable… I don’t know how you found the time!! Just a little at a time. 🙂 You can do a lot with 15 minutes here and 15 minutes there. Really cute ideas. I love the creativity. 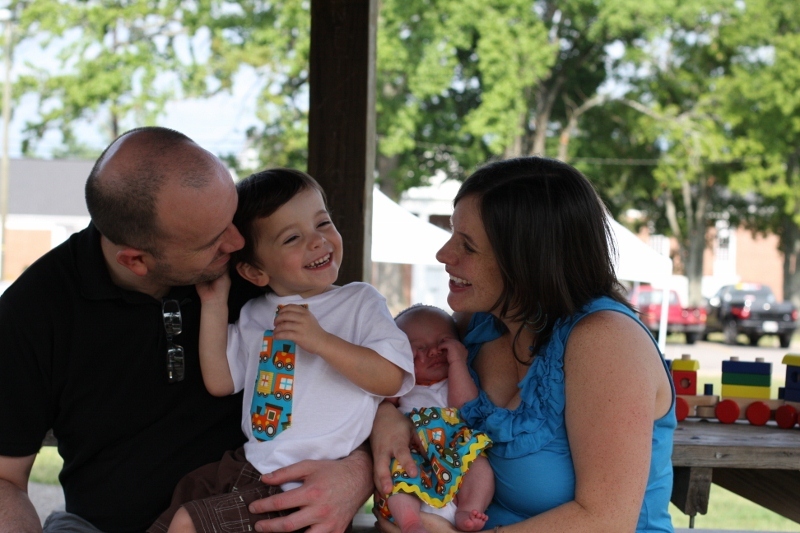 Visit our website (www.dhrailroad.com) to see how you can add train rides to all the excitement to go with the theme. We have a fire truck too. Serving the Nashville, TN and surrounding areas.